Today, the HSBC conducted the walk on Semakau, and 4 of us (the regular Semakau Guides) were tasked to be the hunter-seeker. Such a priviledge is rare, as we are usually the guides and lack the opportunity to explore. This time for convenience of work, I can only arm myself with my shorter macro lens (Nikkor 105 mm Macro - all pictures taken with this lens. Camera set to Speed mode at 1/500 sec). Well that priviledge did come with a price, I mean a "menu"from the HSBC guides. For things they would like us to find! But... the weather is hot, the lowest tide was at 6 pm, and we were at the inter-tidal area at 3:30 pm. Our experience told us that most creatures rather hide in such blazing sun, and to compound the problem - the tide was still high. 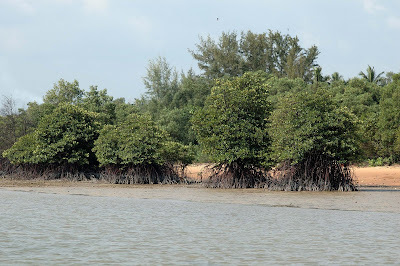 Look at the water line near to these mangrove (Rhizophora sp), usually these are dried ground! Undaunted, we have a task to perform, and we can only scout the areas before the sea-grass meadow. Honestly we were getting desperate, even the common sea-stars were nowhere to be found. So we landed ourselves - Flower Crabs, Gong Gong, Chu Chu - things we seldom point out during our guided walk as they were in abundance. That was how desperate we were! But the tide has to recede, and slowly we ventured deeper and outer and that is where the Surprises begin. Greetings us on the opposite shore, was this beautiful Great Billed Heron (Ardea sumatrana), the tallest bird in Singapore and also one of the rarest. 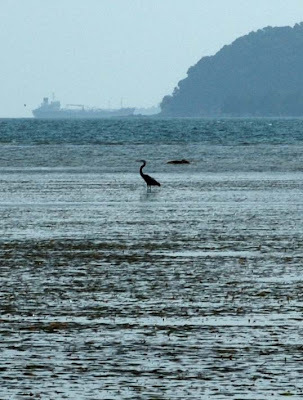 There are couple of them that have taken up residence in the southern part of Singapore, and all the more so - Semakau is a very important site for both this bird as well as our nature heritage. Apparently it was feeding time for most of the crabs were foraging in the sea-grass and sea-weed areas. 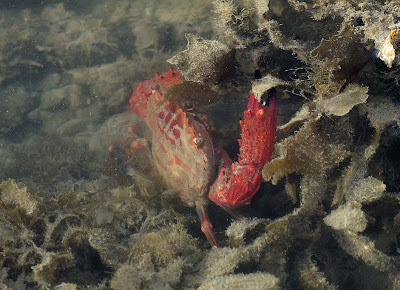 I came upon this Eye-wide-apart crab (Thalamita spinimana) or Red Swimming Crab feeding on the sea-weed. 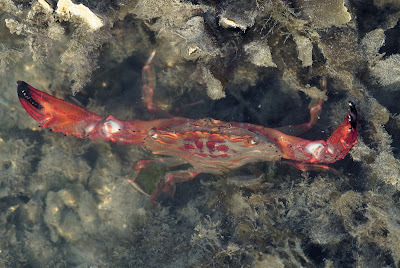 This is a very aggresive crab, unlike the other types of crab which will scurry away, this type of crab will stand its ground. Realising I was intruding, it raised its pincers to tell me to ward off. So this crab should be the emblem of any security unit for this crab apparent motto is "Be Alert and Stand your Ground"! 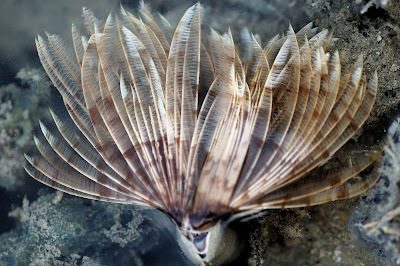 On the "menu"was Fan Worm (Family Sabellidae), a filter feeder with the feathery tentacles. When disturb, the worm will retreat into its tube, and this happens in lightning speed. The tube can be seen in the lower part of the picture below. 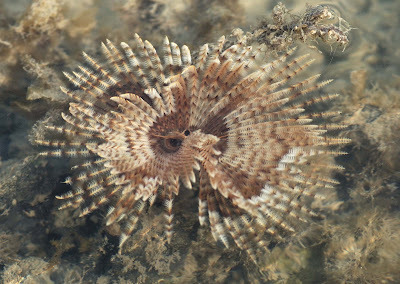 Another specimen of the fan worm, but this one - the mouth can be seen. The tentacles will draw the food into the mouth. 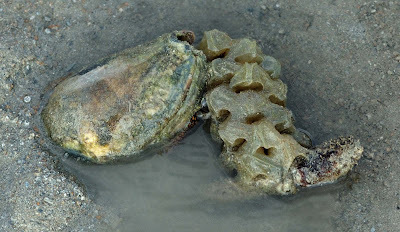 We found numerous Noble Volutes (Cymbiola nobilis), some laying their transcluent egg capsules, other burrowing in the sand looking for preys. 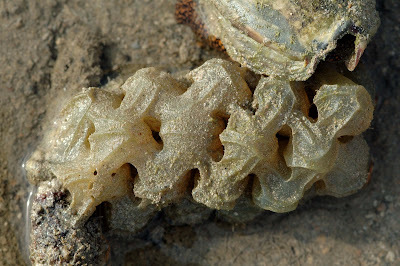 I was intrigued by the way the volutes laid the egg capsules, somehow there is a pattern to it. At this time for want of a proper description, I will call it the 2-1-2 formation. Why 2-1-2 formation, look at the photos below. 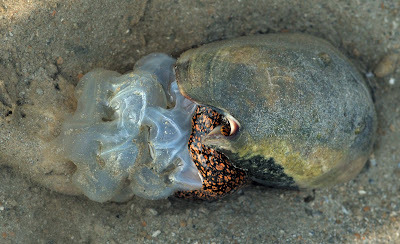 Due to the way, the volute lays its egg capsule, it seems to be dong from one direction to the next, and then do the centre, and so-on. The 2-1-2 formation is clearer in this picture below. 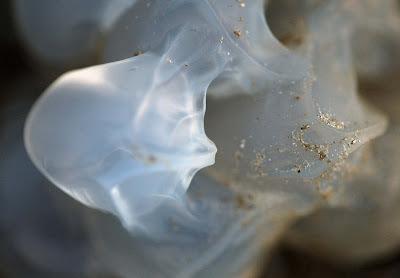 In one specimen, I managed to capture this close-up of one of the capsule. It is very beautiful. 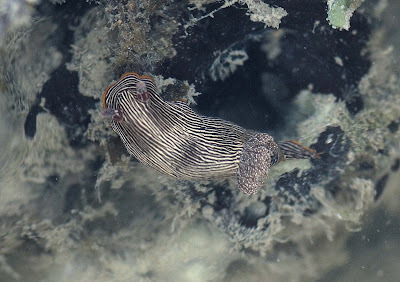 Heart Cockle (Corculum sp) - not on the "menu" but we have seen them couple of times on Semakau. 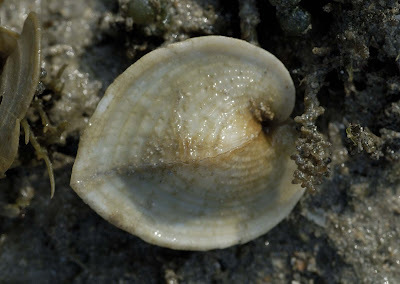 This bivalve has a symbiotic relationship with a type of single celled algae in its tissue, excess food from the algae photosyntheiss leached out to provide nourishment to its host. One of the star attraction to Semakau, is the Knobbly Sea Star (Protoreaster nodosus). 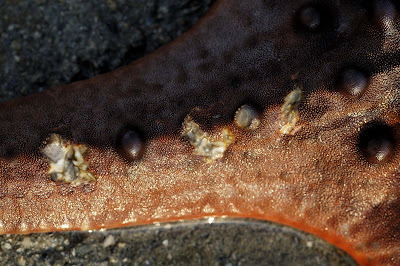 This is sometimes called the Chocolate Chip Sea Star because of the black nodules. Sadly, this poor Knobbly is suffering from some damage as though some creatures had taken a bite at the "chips". 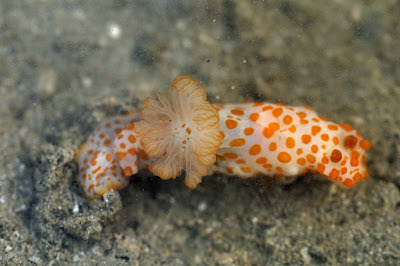 Again on the "menu" was nudibrance, we spotted this Orange-spotted (Gymnodoris rubropapulosa) stranded on the sand, away from its natural habitat of sponge and rocks. Another Nudibranch (Chromodoris lineolata) was spotted in its natural habitat. 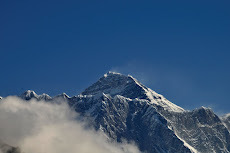 Glad that we have the opportunity to be the hunter-seeker, which provide opportunity for us to document our findings. 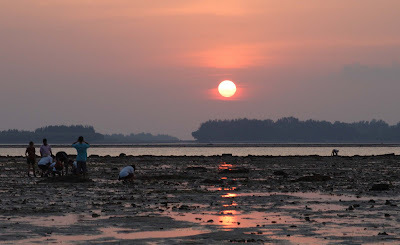 At last, the real low tide - picture of sunset was taken at 6:55 pm. What a glorious sunset, and the people still loiter refusing to depart.